What else can I expect from an MPP or MPA program? Are you an analytical individual looking to jumpstart your career? Do you hold an undergraduate degree? Are passionate about public policy and have an eye for nuance and detail? If so, a master of public policy (MPP) or master of public administration (MPA) might just be the perfect degree for you. MPP and MPA programs prepare students for an array of administrative, detail-oriented positions. These programs are ideal preparation for city manager, policy director, policy public analyst, and even law enforcement positions. As U.S. News reports, it's not uncommon for students to switch from a law degree to an MPP or MPA after learning about the field. These degrees are prestigious, flexible, multidisciplinary, and prepare graduates for a variety of professional positions. Policy analysts, for example, draw from the social sciences to better understand which factors lead to the formulation of public policy and how future policy can be both effective and ethical. The degree can also be lucrative: according to Payscale.com, an environmental health director with 10 years of experience and a master's degree earns a median yearly salary of $111,000. MPP and MPA course curriculums vary by institution. However, each program stresses interdisciplinary application while challenging students to examine policy from all angles. Many programs also require that students complete a relevant internship before graduation. Every community in the United States requires policy consideration, both in the public and private spheres. As established communities grow and new communities develop, the need for MPP or MPA-holding professionals will only increase over time. By earning your MPP or MPA online, you can work toward earning your degree while maintaining a full-time job. Learn more about what policy analysts do, why they're so important, and how an MPP or MPA can enrich you both personally and professionally with this useful guide. Will an online MPP or MPA provide me with the skills I need to advance my career? One of the major advantages of MPP and MPA programs is that students with any type of undergraduate degree can pursue them and shift their career toward a new, policy-related direction. While exactly how they're defined varies from institution to institution, at their core, MPP and MPA degrees hone an analytic approach to policy. In turn, they're well-suited for city, state, and federal government positions where policy is a major factor. They're also broadly applicable within the private sphere, particularly wherever interpretation, analysis, or the crafting of internal or external policy plays a significant role. Will an online MPP or MPA work with my schedule? Online degrees allow students to tailor their coursework around busy schedules while meeting the rigorous demands of traditional, on-site coursework. Recent advances in technology, such as the widespread availability of handheld devices capable of live streaming, have led to major advances in online classroom capabilities. Some schools offer hybrid programs where course curriculum is partially on-site and partially online, whereas others offer programs that are entirely web-based. Online courses are excellent options for students with professional or personal commitments that may otherwise interfere with traditional classroom schedules. It always helps to be prepared. If you haven't taken the GRE yet, you should read our guide to the test. Be sure to pay close attention to the program's online MPP and MPA program requirements before applying to avoid any unexpected complications. For example, while a course may be conducted online, it may still require the completion of an internship before the degree is awarded. What jobs can I get with my MPP or MPA degree? MPP and MPA degrees are ideal for a broad swathe of positions. These positions often fuse analysis and administration: MPP and MPA-appropriate positions may either focus on analysis of current or past policy, or positions may involve the development of future policy—and its potential benefits and ramifications. MPP and MPA holders play an integral role in day to day operations in both the public and private spheres, from all levels of government to administrative positions in the private sector. Examples positions include policy director, city manager, policy public analyst, law enforcement, and public relations consultant. What are the best online MPP and MPA programs? What qualifies an online MPP or MPA program as the best ultimately depends on personal preference. Only you can decide which MPP or MPA programs are best for your goals and needs. Consider the list below as a starting point for that very personal decision. The first step in identifying the best program for you should involve a comparison of available programs and how they differ from one another. The list below is an excellent place to begin that search. Our rankings are based on a variety of factors. These factors include career support services, available specializations, student outcomes, and course availability. Before deciding on a program, we strongly recommend contacting college admissions specialists to discuss program specifics, including MPP or MPA programs requirements. Northwestern's master's in public policy and administration online is a part-time program designed for completion in two or three years. The program's curriculum blends the analytical and administrative aspects inherent in public policy to give students a more inclusive perspective of the field. Specializations are available in public administration, public policy, global policy, or global health; the global health concentration is only available to online learners. Coursework is divided into core and elective work, along with a final thesis or capstone project. Elective courses allow students to customize their degree, with available choices like the nonprofit/NGO sector and global economic policy. As they progress, students gain the knowledge and skills needed to design and manage public policy programs, communicate value propositions to stakeholders, and apply an ethical lens to policy and administrative decision-making. Graduates are prepared to inform and lead public administration and public policy on local and international levels. Perhaps in part due to its location in Washington, D.C., American University is a leader in public policy education. The university offers its students access to policy experts, experienced faculty, and a robust alumni network. American's two-year master's of public administration and policy (MPAP) program blends the school's online master's of public administration and online master's of public policy programs to develop students into well-rounded leaders in public management. Online courses are designed by faculty, many of whom have a range of D.C.-based experience with NGOs, government-funded public policy research, and D.C. think tanks. All instructors delivering MPAP content have advanced degrees in public policy. American's master's in public policy program prepares students for a variety of jobs in public policy across the private, public, nonprofit and governmental sectors. Applicants to the program are not required to have a bachelor's degree in public policy. Admission requirements include a phone interview with an admissions advisor, two letters of recommendation, and minimum GRE or LSAT scores. A limited number of online merit scholarships are awarded annually to students who demonstrated excellence in their undergraduate studies and show potential for outstanding leadership in the field. Beyond the degree offerings at its downtown Pittsburgh campus, the University of Pittsburgh offers several fully online graduate programs. Students interested in earning an online master’s degree in public policy can complete the 30-credit hour MPP program in 19 months with continuous enrollment. Each term, distance learners enroll in two, three-credit courses, making graduation possible after five terms. Alternatively, candidates can choose a slower pace and take one course each term. Courses teach distance learners a variety of new skills. Students earning their MPP online explore topics in economics, leadership, global governance, and strategic management, and learn about various types of research methods and program evaluation. Online applicants are not required to submit GRE scores. All students, regardless of residency, will pay in-state tuition for this program. IU-Bloomington's master's of public affairs degree is a blend of the school's master's of public administration and online master's of public policy programs. This 48-credit public affairs degree is composed of six core courses, up to 10 advanced electives, and a real-world experience component. This last requirement can be fulfilled through an internship or an individual or group research project, or can be waived through qualifying prior professional (or military) experience (PPE). Some students may also be eligible to earn up to 12 PPE credits toward completion of the program. To graduate, students are required to complete a capstone project in public and environmental affairs. Most students complete two courses per semester, though students can add to their course load with permission from the faculty director. IU-Bloomington's MPA degree offers a choice of four specialized career tracks: public management, nonprofit management, policy analysis, or public budgeting and financial management. As one of its elective options, the school offers students the opportunity to complete a week-long, on-campus residency. Program applications are accepted during the winter, spring, and fall for admission in the following semester. Located in Lynchburg, Virginia, Liberty University is the largest private and nonprofit institution of higher education in the country. It's also the largest Christian university in the world. Liberty's master's in public policy online program boasts a streamlined application process with minimal requirements: besides a $50 application fee, students must only complete the application and submit bachelor's degree transcripts with evidence of a minimum 3.0 GPA. Students can transfer up to 15 previously-earned credits toward the total 39 credits required to complete the master's of public policy program. Liberty offers multiple flexible tuition payment plans that allow students to pay for their education in installments. Though it isn't mandatory, students can choose to specialize in any one of the following areas: campaigns and elections, international affairs, Middle East affairs, or public administration. Core courses provide students with a strong foundation in governance and politics, focusing on topics such as leadership, statesmanship & governance, and geopolitics & international diplomacy. Ambitious students can choose to write and defend a master's thesis. UM-Columbia's master's of public affairs online covers foundational topics like ethics, leadership dynamics, and public policy strategy. Example courses include economic analysis for public policy and strategic management of public service organizations. Graduates are prepared for a range of public policy jobs, working as policy analysts, public administrators, government relations coordinators, and in many other roles. This 33-credit program, delivered 100% online, offers the same competitive annual tuition rate to all distance learners, regardless of state of residence. Accelerated courses are structured in nine-week terms, with most students taking one course each semester and completing the program in two years. Application requirements include three years of consecutive, professional public policy experience, a bachelor's or other advanced degree, and a minimum 3.0 GPA in undergraduate studies. While UM-Columbia's programs are available to students in most states, some state restrictions apply. Financial aid options, including loans, scholarships, and grants, are available to distance learners. Located in Richmond, Virginia Commonwealth University allows working professionals, returning adults, and distance learners the opportunity to earn degrees on their own schedules thanks to their extensive offerings of evening and off-campus courses. VCU offers a public policy master’s degree that requires 39-credit hours. The hybrid master of public administration (MPA) program allows students to select a generalist degree track or one of the available concentrations, including an emphasis in public policy analysis and evaluation. Courses cover econometrics, management science, and program design and evaluation in the nonprofit sector. Students entering the program without at least one year’s experience in the public or nonprofit sector must also complete a three-credit internship. However, distance learners with at least one year of professional experience in the field may waive this requirement and graduate with 36-credit hours of coursework. In addition to two physical campuses in Oregon, Oregon State University also has a growing online presence. Students can earn their master’s in public policy online at their own pace and through a program they can customize to their goals and interests. The online master’s in public policy includes four different concentrations that learners may emphasize in: energy policy, environmental policy, rural policy, and social policy. Each includes different electives to choose from, giving students the opportunity to work with their academic advisor to build a degree program that will best serve their goals. The program requires a minimum of 46 credits, and an oral examination before graduation. Students must also complete an applied policy capstone project, focusing on a policy issue that is relevant to them. Located in Northfield, Vermont, Norwich University was founded in 1819 as the country's first private military college. The university offers a variety of degrees both on campus and online. Norwich's online master's of public administration with a concentration in policy analysis and analytics is geared towards professionals in public service organizations. Students in the program have come from law enforcement, local government agencies, nonprofits, and other sectors. A range of available concentrations meet students' diverse backgrounds, with options including public works and economic sustainability, city governance, nonprofit leadership, and international relations. A final capstone project or paper allows students the chance to develop a viable solution to an existing issue in their chosen field. Asynchronous course schedules and four start dates during the year make this student-centric program an excellent choice for busy nontraditional students. Norwich offers small class sizes, capped at 15 students, that allow for one-on-one instructional support. The university's MPA program can be completed entirely online, with the exception of a mandatory, one-week residency on campus. With full-time study, students can earn their MPA degree from Norwich in less than two years. VSU's 100% online master's of public administration with a concentration in public policy offers an asynchronous course structure. Students take courses in advanced government foundations and policy to develop the analytical, communication, and leadership skills needed to become administrators or managers in government or a public service organization. VSU's non-thesis MPA degree is designed for both professionals in the public service sectors, and students with no prior academic or professional experience in public administration. In addition to a capstone seminar, students complete a 300-hour internship with a public or nonprofit agency, gaining first-hand experience in activities like budgeting, program development, and administrative duties. Graduates of VSU's 36-credit MPA program are qualified to pursue a number of jobs in public policy, including directors, policy analysts, and city planners. Admission requirements for the MPA program include recent college-entrance exam scores and three letters of professional reference. UN-Omaha's online master's of public administration with a concentration in public policy equips students with an in-depth understanding of how policy is created and put into law, with additional study of policy analysis and administrative law. Core courses emphasize policy creation and public organizational management, with classes like policy design and implementation and organization theory and behavior. A diverse set of electives allows students to customize their area of study, with options including internships and seminars on topics like grant writing and metropolitan planning. Students can either choose a 39-credit, non-thesis option, or enroll in the 42-credit thesis track. High performance standards require students to maintain a minimum GPA of 3.2 during their first year of study in the MPA program. The MPA program at UN-Omaha offers a fall and spring application deadline for admission in the next semester. The university's School of Public Administration also has several graduate-specific, merit- and financial need-based scholarships available to qualifying students. Empire State College is a part of the State University of New York system particularly designated to provide education to returning adults, working professionals, and other nontraditional students. To better serve nontraditional students, ESC has 35 different locations around the state of New York, along with a generous amount of fully-online programs. Working professionals in public and private sectors of public policy can pursue Empire State's MA in social and public policy program. The hybrid MPP program consists of 12 three-credit courses, some of which are residency-based, totaling 36 required credit hours. These courses cover policy process, policy implementation, ethical issues in social policy, and public policy analysis. Students must also design and complete a final project. Distance learners may tailor their electives to their interests and apply them towards advanced certificates. Located about three hours south of Chicago in Charleston, Eastern Illinois University is host to several online graduate programs, including an MA in political science. Students can graduate from the program in two semesters and one summer of enrollment. Online candidates interested in earning an online public policy master’s degree with foundations in political science can pursue a concentration in public administration and public policy. In addition to studying fundamentals in public policy and administration, students also explore topics in international policy issues, classical political theory, and civic leadership. Students have the option to complete a capstone seminar course or a thesis project prior to graduation. The total number of required credit hours will vary slightly based on which option you select. Located in picturesque Virginia Beach, Regent University is a private Christian university that offers a variety of online graduate programs suited to busy professionals. Regent’s master of arts in government - law and public policy prepares students for careers as public policy advocates, lobbyists, nonprofit managers, and more. Distance learners explore topics in religion and politics, biblical law, human rights, constitutionalism, and law from a Christian perspective. The fully online curriculum includes courses like U.S. foreign policy, Christian foundations of government, and economic policy. Full-time students may graduate within 18-24 months, while part-time learners usually need three to five years. The program totals 30 required credits. Applicants are not required to submit GRE scores. All students pay the same tuition regardless of residency. New England College, a private college in New Hampshire, commits to undergraduate and graduate programs that emphasize experiential learning. Students unable to attend classes in Henniker can earn the master of arts in public policy online with no residency requirements. Faculty use an asynchronous curriculum to teach students the inner workings of the American political and public policy systems. 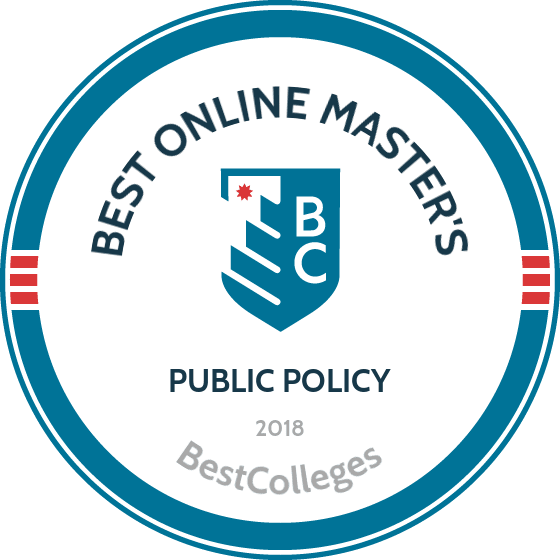 The 36-credit online public policy master's examines the origins of American democracy; economic and public policy analyses; America and the world; class, poverty, and race; and campaigns and elections. Faculty require students to complete a capstone in which they conduct research on a public policy challenge, identify best practices, and develop a comprehensive plan that outlines solutions. Students take two seven-week courses per semester to graduate in two years. The program admits learners six times per year in the spring, summer, and fall. Admission requirements include a bachelor's degree with a minimum 3.0 GPA; no GRE or GMAT scores are required. Some programs offer public or private sector specialization options. Programs may require completion of a relevant internship before graduation. Because MPP and MPA degree programs don't require a specific undergraduate area of study, candidates considering the employment benefits of MPP or MPA degrees are wise to consider the benefit of graduate degrees in general. Individuals with graduate degrees generally earn more and have lower unemployment rates. Additionally, more and more jobs are only available to individuals with master's degrees: According to U.S. News, "in many career sectors, such as higher ed administration, public affairs, and social services, a master's degree is replacing a bachelor's as the minimum requirement for employment." MPP and MPA graduates see widely varying salary rates. According to U.S. News, an MPP or MPA-holding individual's decision to go into the private or public sphere has a major influence on salary levels. For example, while a court administrator with ten years of experience and a graduate degree in MPP or MPA makes an annual salary of $61,000, an environmental policy director stands to make nearly double that figure. There's no reason to go it alone. Professional connections are crucial aspects of getting the absolute most out of your MPP or MPA degree. By connecting with others within the field, you stand to gain invaluable advice, make important contacts, and benefit from crucial resources. Below are three of the most notable organizations for professionals with MPP or MPA degrees. All three regularly host events and provide a variety of useful services for members. Some provide online job boards, continuing education, and a variety of other services. These resources are particularly valuable once your MPP or MPA degree has been completed and you prepare to enter the job market. Association for Public Policy Analysis & Management (APPAM): APPAM focuses on not only connecting professionals with MPP or MPA degrees but also providing resources and opportunities. The American Society for Public Administration (ASPA): The ASPA is the largest organization for public and nonprofit administration in the United States. The ASPA connects professionals in the field, including MPP and MPA degree holders. Network of Schools of Public Policy, Affairs, and Administration (NASPAA): Focused specifically on individuals holding MPP or MPA degrees, NASPAA seeks to connect professionals while promoting ethical public service. While online programs are generally more affordable than their on-site counterparts, the majority of students still require financial assistance. To learn more about loans, grants, and other opportunities offered to students by the United States government, complete a Free Application for Student Aid (FAFSA). Additionally, scholarships and grants from private, non-government sources are frequently available by way of companies, nonprofits, and others. Browse our handy collection of resources below to start your search.